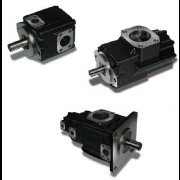 Denison Hydraulics produce a full range of hydraulic vane pumps and hydraulic motors that operate at pressures in excess of 4,500 pounds per square inch ("psi") and vary in size from 0.35 cubic inches to 16 cubic inches, and in displacement from 1 to 250 gallons per minute ("gpm"). Denison Hydraulics hydraulic vane pumps are recognized as among the strongest products in the hydraulics industry and are distinguished by their unique patented double-lip design, in which the vane is in contact with the cam ring at two points rather than at one as with the single-lip design. This double-lip design makes Parker Hannifin HPD's hydraulic vane pumps less susceptible to contamination than single-lip pumps. • T6B, T7B, T6C, T6D, T6E, T6CM, T6CP, T6DM, T6EM, T6CR, T6DR, T6ER and T6CSH single pumps. • T7BB, T67BB, T67CB, T67DB, T67EB, T6CC, T6DC, T6EC, T6ED, T6CCM, T6DCH, T6ECM and T6EDM double pumps.